Take a look at our brochure below (click to view). Requiring DUI first offenders with a Breath Alcohol Content (BAC) of .15 or greater to complete the program. Removed the hard suspension period associated with DUI second and subsequent offenders. Removed the option of non-participation in the IID Program; requiring completion of the program before obtaining a non-restrictive license. Provides stiff penalties for driving a vehicle without the IID. Tamper with the Breath Alcohol Ignition Interlock Device (BAIID) installed in their vehicles in order to prevent the BAIID’s proper operation, or to obscure or cover the lens of the camera attached to the BAIID. Allow a third party who is not driving the car to blow into the BAIID on their behalf in order to start the vehicle or to conduct a running retest. The program participants are required to have their breath alcohol ignition interlock devices (BAIID) inspected and the data downloaded at least every 60 days by the service center providers. Drivers with an offense date between January 1, 2008 and September 30, 2014 who decide not to enroll will remain suspended for three years beyond the initial suspension period. Such drivers who decide to enroll in the IID Program must complete the full term required by the Program. Drivers with an offense date on or after October 1, 2014 will not have the option of getting their driver’s license until successful completion of the IID Program. Those drivers who decide not to enroll will remain suspended indefinitely. If your license was suspended because of an alcohol-related offense, you may be eligible to participate in the IID Program. Please contact the South Carolina Department of Motor Vehicles to determine your eligibility. 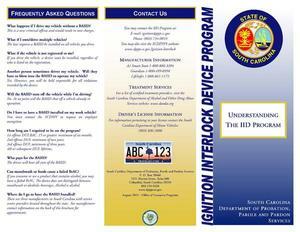 This video provides additional information for drivers who are enrolled in the South Carolina Ignition Interlock Program. Este video prove información adicional para conductors inscritos en el Programa del Dispositivo de Ignición Interlock de Carolina del Sur. Para ver el video en Español, haga click aqui.